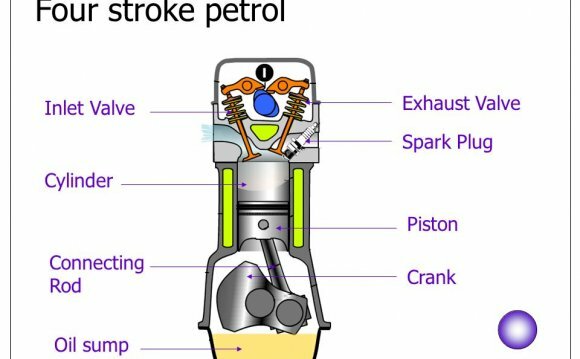 ANIMATION OF FOUR STROKE INTERNAL COMBUSTION ENGINE (CAR ENGINE / PETROL ENGINE): This animation explains how a petrol engine works. It shows a highly simplified 4-stroke engine cycling through the intake, compression, power and exhaust strokes. INTERNAL COMBUSTION ENGINES are mechanical devices that use controlled explosions (combustions) of petrol (gasoline) and air mixtures to rotate wheels. The reciprocating (back and forth) engine explodes the mixture (of fuel + air) in a cylinder that forces the contained piston to move. This movement of the piston is transmitted (via the connecting rod) to a rotating device (crankshaft shown as a simple red disc) which is ultimately connected to the wheels (via gears, usually). This is how cars run on petrol. The ubiquitous four stroke engine is so called because the piston repeats a sequence of four strokes for every explosion. This animation shows a highly simplified engine to illustrate this process. In reality, the components often have highly complex and irregular shapes. Since a realistic rendering might obscure the underlying process I have reduced the components to their simplest form. Car engines have multiple cylinders contained together in an engine block. Usually these contain 4, 6 or 8 cylinders. For example a V6 engine contains six cylinders arranged to create a V configuration. FOUR STROKES ANIMATED: the animation begins with the piston at the top of the cylinder. The piston moves down and the petrol air (gasoline-air) mixture enters the cylinder. The inward flow of the air-fuel mixture is illustrated as a rotating spiral entering the engine through the purple inlet. The piston then moves upwards and compresses the air-fuel mixture. The sparking plug (spark plug) then fires (an electrical discharge) and the compressed mixture explodes (by contrast, use the heat of compression to ignite the mixture). This explosion drives the piston downwards in what is called the power stroke. The piston then returns to the top of the cylinder in the exhaust stroke and drives the exhaust gases out of the engine. The exhaust gases can be seen leaving the (orange-yellow) exhaust tube as a cone of pale orange. The flow of gases is controlled by valves (not shown) whose movements are timed to allow the inflow of fuel and air and the outflow of spent gases. The intake valve (which would be at the point the purple fuel line enters the top of the cylinder) opens during the first (intake) stroke and allows the fuel-air mix to enter the cylinder. It then closes to seal the cylinder during the remaining part of the cycle. The exhaust valve opens during the final (fourth) stroke to allow the exhaust gases to leave. PETROL (GASOLINE) ELECTRIC HYBRID VEHICLES: contain both a petrol engine and an electric motor. Each contributes to powering the vehicle depending on conditions. Energy is stored in the fuel tank (as gasoline) and in batteries (cells). Hybrid vehicles are attracting great attention because they use less fuel (petrol / gasoline/ diesel fuel) than conventional vehicles. With the increasing price of oil and worry about carbon dioxide emissions hybrid cars (and other hybrid vehicles) are increasing in popularity.